April | 2014 | cut it out, stitch it up! 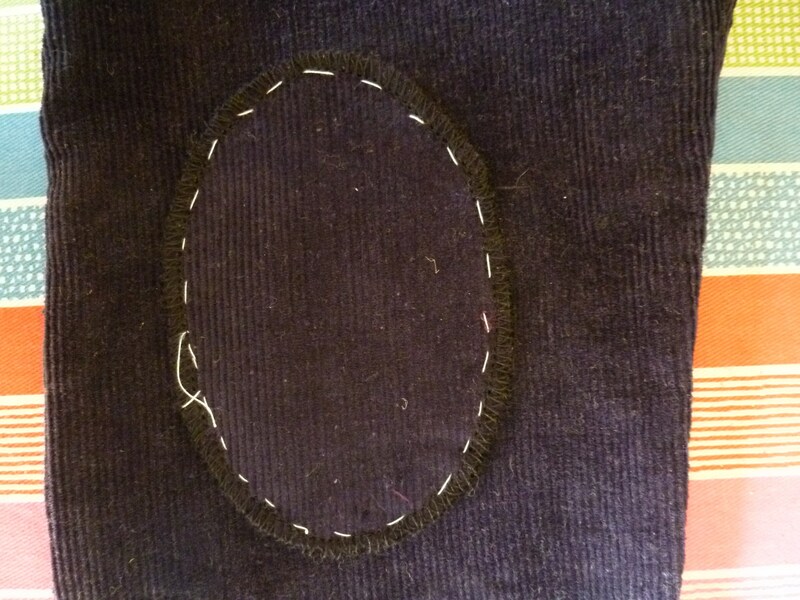 ‘I, Helen, of Cut It Out, Stitch It Up, sign up as a participant of Me-Made-May ’14. I endeavour to wear one piece of me made clothing each day for the duration of May 2014’. I felt quite confident a few weeks back but looking in my wardrobe yesterday I think it will be a challenge and it has shown me there are gaps in my me made wardrobe. I could do with some skirts and everyday dresses. Hopefully this will help me focus on what I need to sew in the future. I do have plans but not enough time! I could get though the month by rotating PJ bottoms and hand knitted socks but I shall try not to rely on them. I dislike mending, I even find sewing on a button an be a bit of a chore and items tend to get left lying around for a while before they get fixed. 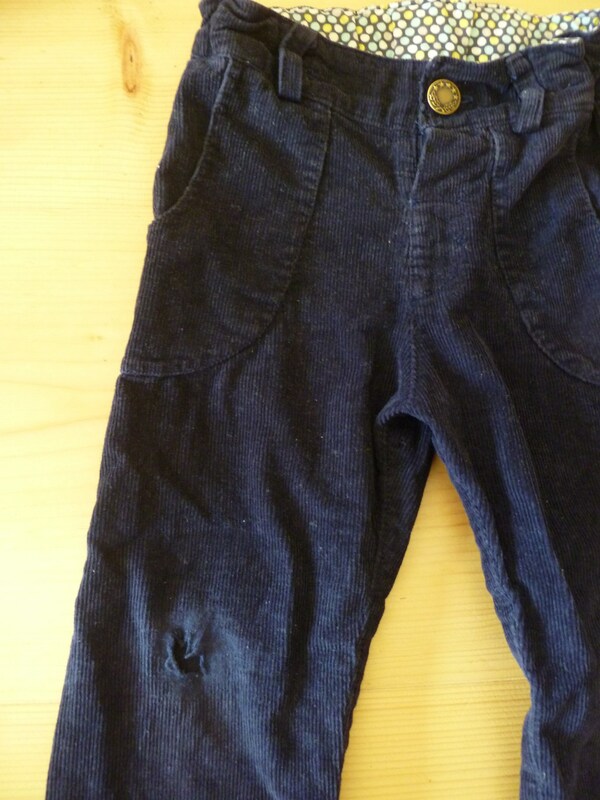 In just over two months my son has wore a hole in the knee of the corduroy titchy thread skinny jeans I made him during Kids Clothes Week at the end of January. I love these trousers. I think they are the most successful piece of children’s wear I’ve made and I still feel a little bit proud when he wears them. 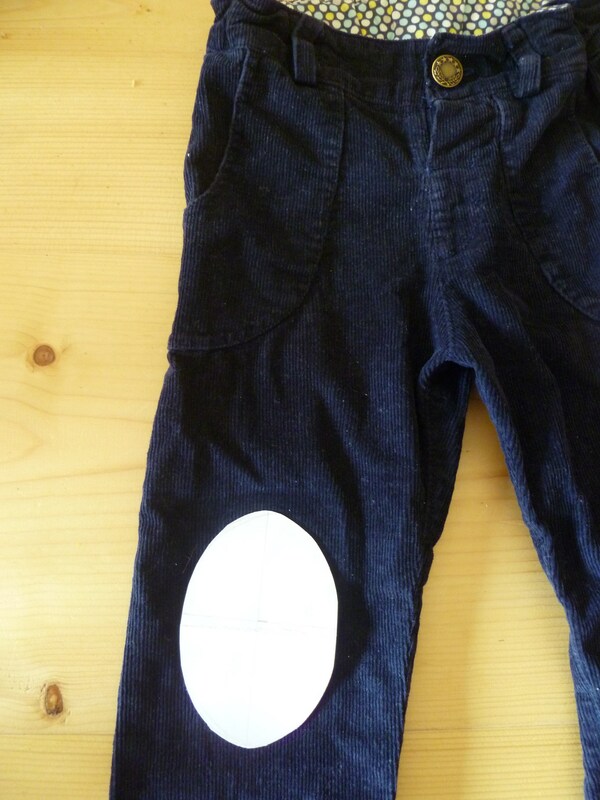 So, as the rest of the trousers are still in good nick and still fit they needed some knee patches. To start with I put some iron on lightweight interfacing on both sides of the hole to stop it from fraying and getting any bigger. I cut out an oval shaped template. I added iron on lightweight interfacing to the back of the patches and I overlocked the edges of the patches and tacked them in to position. 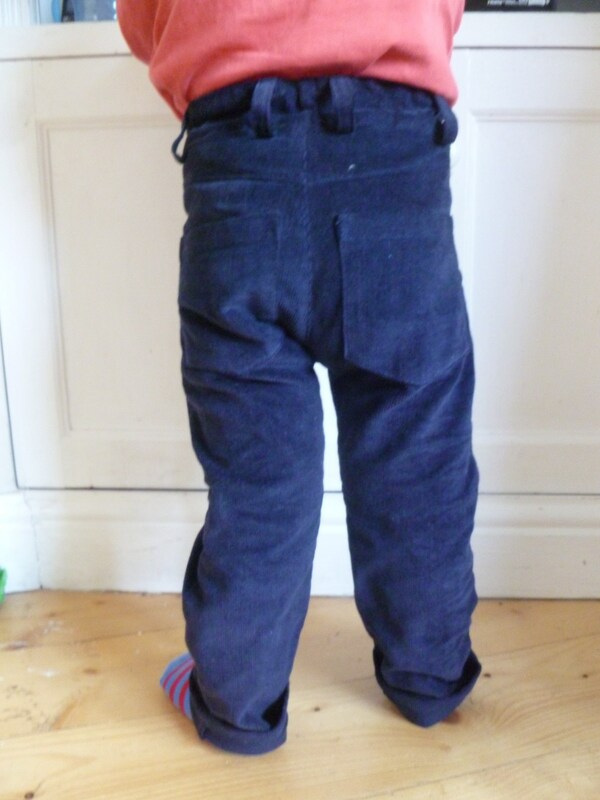 I stitched them to the knees of the trousers using a small zig-zag stitch. I had doubts that I could get these under the machine with the narrow width of the legs but I did that thing I did when flat felling the underarm / side seams of a shirt where I don’t try to use the free arm of the machine but stitch inside having turned the legs inside out first. Not a very good explanation and difficult to photograph. Hopefully the knees will last until he grows out of them. When I made these earlier in the year I was able to use the free age 2 pattern. The next pair will be a bigger size and I have already bought the pattern of the full size range. Titchy Threads Skinny Jeans . 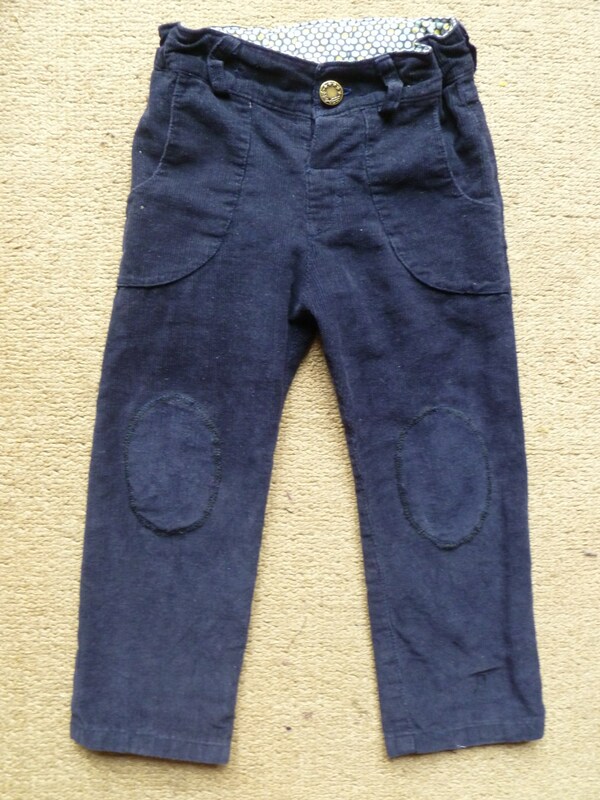 Even though the corduroy was a lovely fabric I think the next pair will be denim and I’ll add some knee patches at the start. It seemed there was no issue with knitting and flying and I successfully took my knitting from Manchester to Heathrow to Shanghai to Guanzhou to Hong Kong and back in my hand luggage. I was using bamboo needles which I suppose don’t show up on an x-ray, it could be different with steel needles. Completed short row heel – ignore the dropped stitch! In real life these are much more purple than the photo shows. I was back on the Regia Mix It! Color for a self patterning look. I think I was wise to stick to a stocking stitch (plain) pattern as the dimmed lights of the plane and subsequent jet lag wouldn’t have been able to cope with any type of pattern. This was the first time I had tried a short row heel. I used this tutorial from www.cometosilver.com which I found really clear. There is a photo for each step. I’ve only completed one sock so far and as this was the first time I’ve knitted this heel I can see room for improvement. The stitches at each end of the rows were a bit loopy so these areas of the finished heel look a bit loose. So on the second sock I need to tighten up a bit when I’m knitting. I couldn’t face unravelling the one I’d done and knitting again so I’m just going to put a sewing stitch in to close up a tiny hole. You can see in the photo there is a safety pin securing a dropped stitch, I only noticed this when I came to take the photo and I still need to secure it. Somehow I still managed to have the right amount of stitches when I came to start the heel. There were quite a lot of dropped stitches in this sock which I had to pick up, that’s what I get for knitting when tired. 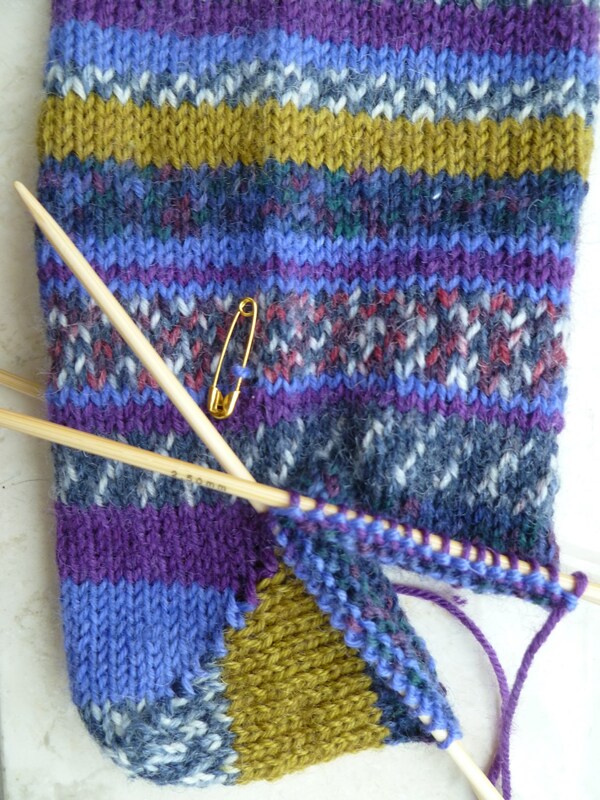 I’m hoping I can pefect the short row heel method as I much prefer it to the heel flap and gusset method. I think it is quicker to knit and I don’t enjoy picking up the stitches along the sides of the heel flap. 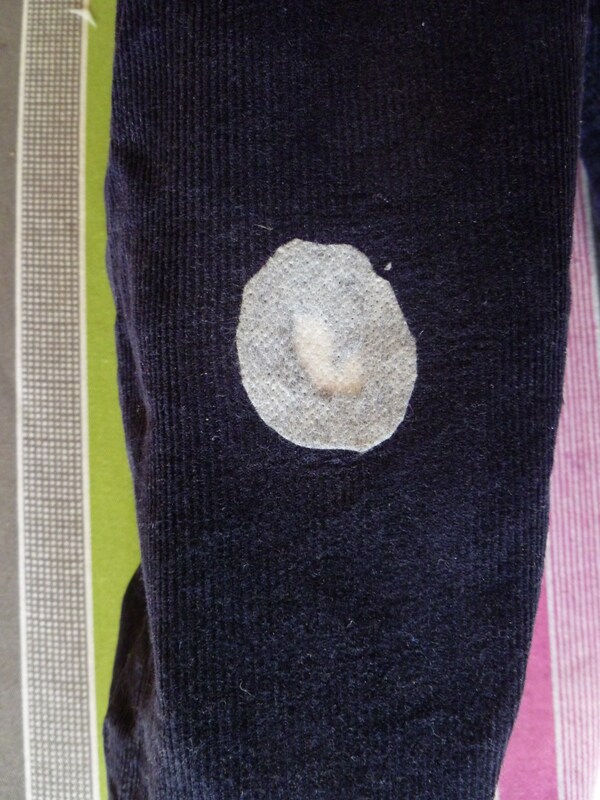 As long as I can get sock 2 looking good I think this will be the way forward for me. 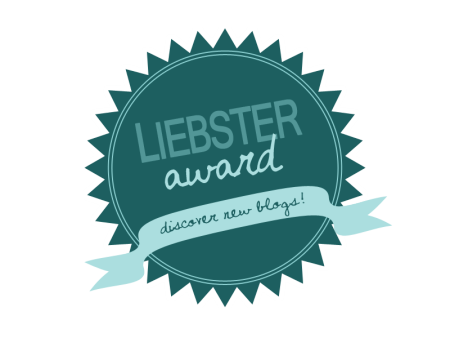 I got a nice surprise last week, Fiona who writes the ‘Seams Straightforward’ blog nominated me for a Liebster blog award. This is a scheme to encourage people to find new blogs to read, which might otherwise be overlooked. The nominees need to have less than 500 follows – well that’s definitely me! I have tried to google to find the origins of the Liebster blog awards but no luck. So it seems to me like a welcome chain letter. It’s lovely to be nominated and to be able to nominate others in return. Fiona nominated 5 bloggers, check out her post for the other 4, and asked 5 questions. Q1 How and when did you discover your love for sewing? I started sewing when I was very young, encouraged by my mum. Q2 Which 5 sewing patterns would you take to your Desert island, to sew and wear forever more – or at least until you were rescued? I don’t think I could pick out 5, I’d just probably spend my time knitting socks but I’d definitely take the Sewaholic Renfrew. Q3 Do you enjoy sewing for others, and if so for whom? Yes, I enjoy sewing for my two children, 6 & 2. Q4 Describe yourself to a stranger in 5 words. I don’t want to really! Q5 What was your biggest sewing success, and also your biggest sewing failure? I made my wedding dress in 2010, that was the most challenging item I had sewn. There have been plenty of failures along the way. There’s not been any one thing that stands out but the Sewaholic Robson Trench could be shaping up to be an expensive unfinished project…. Thanks again to Fiona for the nomination.